An exhibit of farm-themed art by local artists is showing at The Works Bakery Café, A Candle In the Night, and The Marina Restaurant in June 2012. 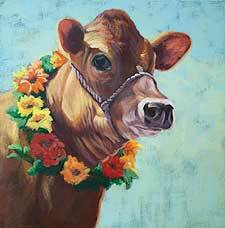 All paintings are for sale, with a portion of the proceeds to benefit Strolling of the Heifers. Info: (802) 380-7006 or email caryn@carynking.com. MARY ISELIN lives with her husband George on their farm in Marlborough, New Hamphshire. Mary is known for light-filled, luminous paintings of lambs, sheep, and other farm animals, as well as for plein air landscapes. CARYN KING's work addresses the individuality and spirit of each farm animal she paints. "One of my main concerns is conveying emotion. I find my subjects close at hand ... starting with my six amazing 'pet' chickens." 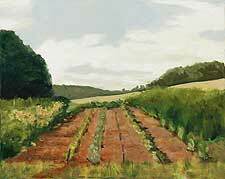 MARJORIE SAYER's goal is to explore ways to experiment with the Vermont landscape in different spatial relationships. Her paintings negotiate the complicated intersections between abstract and the concrete. "I want the barn to exist and be recognizable but gradually become more abstract by bold strokes of color and gesture," Sayer says. "The finished paintings are a result of numerous layers of paint creating a sense of tension between areas of lightness and heaviness, and between barely visible outlines and planes of color." 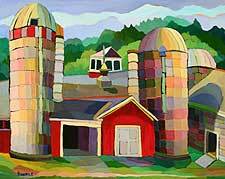 The landscapes embrace the ground, sky, and barns, and are joyful and rich with color. JANET PICARD's recent oil paintings are inspired by the Vermont landscape, the dunes of Cape Cod, a fascination with color and the act of painting. Merging actual places with imagined visions we are transported into a fantastical world that is pulsating with energy and mystery. ROBIN STRONK has spent over thirty years as a veterinarian studying animals. As an artist she applies this knowledge to depict the unique nature of each species and individual. She is particularly fascinated by the story told in their eyes. Robin lives with her husband on a small farm in New Hampshire, where she uses the resident animals as her models. NANCIE McLEAN interests include both painting and sculpture. Often using animals as subjects, currently Nancie has moved toward exploring dream imagery in her work. NANCY CALICCHIO's paintings combine her love of the natural world with the traditional, yet current, uses of the land in farms, pastures, fields and orchards. "Sunlight filtering through the trees, the rushing streams and still pools of water in the dark woods, the mysterious way the river disappears around a sandy bank, the changing colors of the hillsides inspire me with respect, with reverence for our natural world." ANN SAWYER is a New Hampshire farmer and painter who concentrates on painting farm animals. "They are a gift to me and a joy, and I can extend my time with them by my brush and watercolor paints. Over 50 years of my life has been spent working with these beautiful, giving creatures on our 5th generation dairy farm, nestled since 1858 on the rocky soil under Mt. Monadnock." PAUL STONE's oil paintings portray habitable spaces, landscapes shaped by the purposeful interaction of humans with their environment. His work pays homage to the well-husbanded countryside of Vermont: buildings crafted by hand, meadows kept, forests walked, and water moved upon. These paintings reveal the weight of character which human effort has endowed on the landscape and an underlying spirit of place.